From Goodreads ~ Do you ever find yourself snowed under at the office, or even just glued to the couch, when you really want to leave on time (for once), get to the gym (at last), and finally start that fun project you're always putting off? 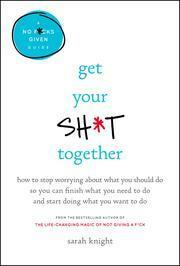 You've really got to Get Your Sh*t Together. Ways to manage anxiety And tons of other awesome sh*t! Soon you'll be setting real goals, crushing them, and getting out the door for happy hour-every damn day. I had read The Life-Changing Magic of Not Giving a F*ck in May and enjoyed it. Like the first book, the title of this one attracted me. This book shows you how to set goals, how to push through small annoyances and obstacles to meet those goals and then how to imagine and achieve even bigger goals that you may not, until now, have thought possible. It will liberate you from the stuff you think you should be doing so you can do the stuff you need to do and get started on the stuff you want to do. Knight helps you breaks things up into small manageable chunks to leave you with plenty of free time to pursue your dreams. I enjoyed the writing style. I found it amusing and sarcastic. Yes, there is a lot of swearing but you figured that out by the title, right? Though it seems to be written in fun, I found there was a helpful message.